Johann Joachim Quantz (1697–1773) was a flute player and composer at royal courts, writer on music and flute maker, and one of the most famous musicians of his day. His autobiography, published in F.W. Marpurg’s Historisch-kritische Beyträge (1754–5), is the principal source of information on his life. It briefly describes his early years and then focuses on his activities in Dresden (1716–41), his Grand Tour (1724–27) and his work at the court of Frederick the Great in Berlin and Potsdam (from 1741). I wanted to be nothing but a musician. 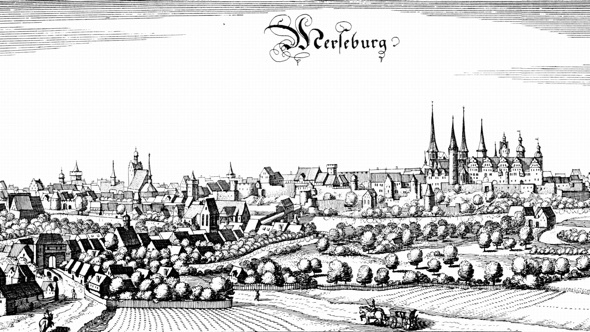 In August … I went to Merseburg to begin my apprenticeship with the former town-musician, Justus Quantz. … The first instrument which I had to learn was the violin, for which I also seemed to have the greatest liking and ability. Thereon followed the oboe and the trumpet. During my years as an apprentice I worked hardest on these three instruments. Due to my own choosing, I took some lessons at this time on the clavier, which I was not required to learn, from a relative of mine, the organist Kiesewetter. Through his instruction I laid the first groundwork for understanding harmony, and probably first received the desire to learn composition. In 1714 he had the opportunity to go to Pirna (a town in Saxony near Dresden) to fill in for a sick journeyman under the direction of town-musician Schalle. During this period in Pirna I saw Vivaldi’s violin concertos for the first time. As they represented a completely new way of composing music they impressed me not a little. I did not fail to supply myself with quite a number of them. The splendid ritornellos of Vivaldi served as excellent examples in the future. Here [in Dresden] I soon became aware that the mere playing of the notes as set down by the composer was far from being the greatest merit of a musician. The Royal Orchestra was in full bloom already at this time. It distinguished itself from many other orchestras by its French smoothness of performance, as introduced by the concertmaster at that time, Volumier; just as it later, under the direction of its concertmaster, Herr Pisendel, who introduced a mixed style, achieved a finesse of performance which I have never heard bettered in all my travels. At this time it boasted of various famous instrumentalists such as: Pisendel and Veracini on the violin, Pantaleon Hebenstreit on the Pantalon [hammered dulcimer], Sylvius Leopold Weiss on the lute and theorbo, Richter on the oboe, Buffardin on the transverse flute, not to speak of the good violoncellists, bassoonists, horn players, and bass violinists. When listening to these famous people I was greatly amazed, and my zeal for continuing musical studies was doubled. I wanted to prepare myself so that in time I too could become a fair member of this excellent company. Quantz spent part of 1717 studying counterpoint with J.D. 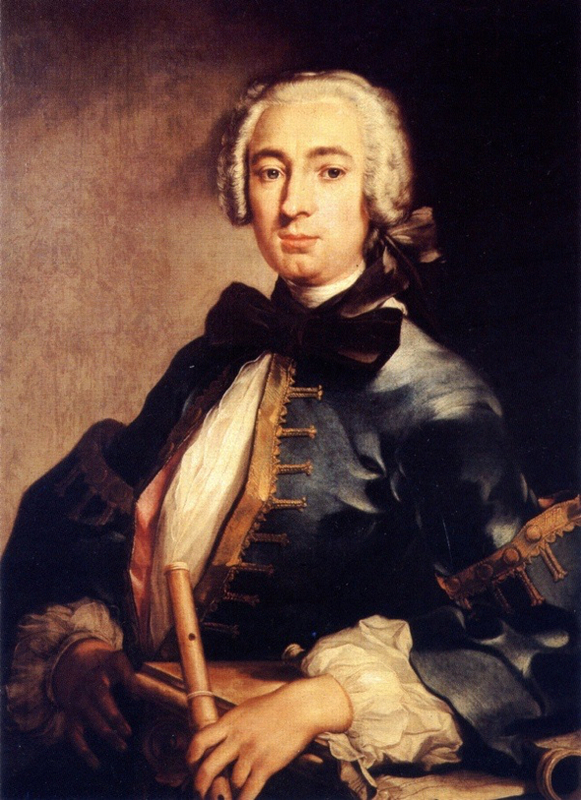 Zelenka and in 1718, at the age of 21, was appointed oboist in the newly formed Dresden Polish Chapel of August II, Elector of Saxony and King of Poland. In March of the year 1718 the so-called Polish Kapelle, which was to consist of 12 members, was established. Since 11 members had already been hired and an oboist was still lacking I was proposed for the job, and after a successful test before the director of the Kapelle, Baron von Seyferitz, I was accepted. 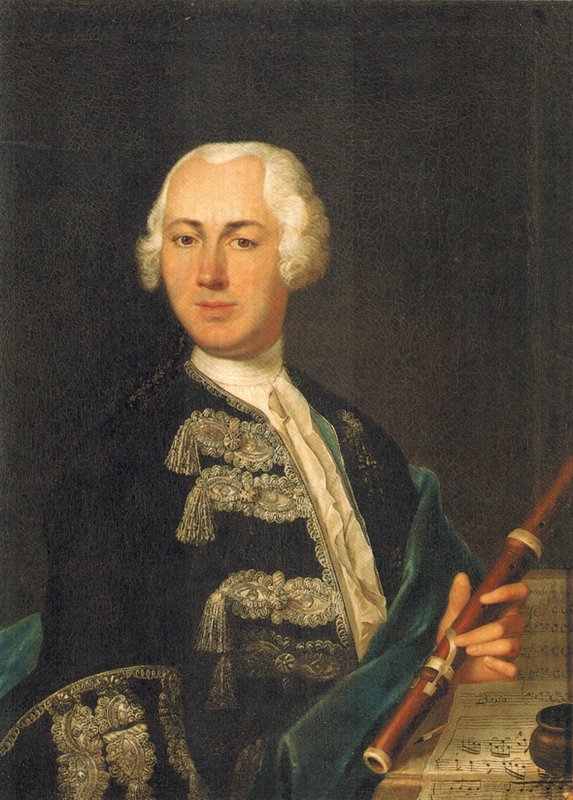 When it became clear that there would be little opportunity for advancement as an oboist in the Polish Chapel, Quantz decided to devote himself seriously to the flute and in 1719 studied briefly with the famous French flute player Pierre-Gabriel Buffardin, principal flute in the Royal Orchestra. Here I reached a turning point, affecting both my previous way of life and my main lifework. The violin, which until now had been my principal instrument, I now exchanged for the oboe. However, I was prevented by my colleagues, who had had longer experience, from excelling on either instrument, which I wanted very much to do. My chagrin over this caused me to take up seriously the transverse flute, which until then I had practiced only for my own pleasure. On this instrument I did not have to fear any special resistance from my colleagues, particularly since the previous flautist, Friese, who had no great inclination toward music, willingly allowed me to take the chair of the first flautist [in the Polish Chapel]. For about 4 months I took instruction from the famous flautist Buffardin in order to learn the peculiarities of this instrument. We played nothing but fast pieces, for this was the “forte” of my master. 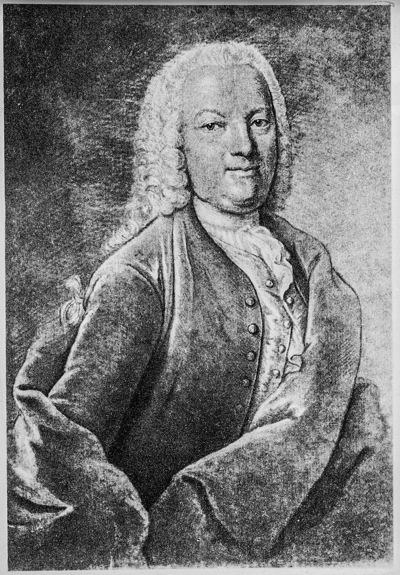 Quantz became an intimate friend of Johann Georg Pisendel, the concertmaster of the Royal Orchestra, who greatly influenced his development as a performer and composer. I was fortunate enough to make the acquaintance of Herr Pisendel, the great, skilful violin virtuoso and Royal Concertmaster after Volumier’s death. This acquaintance, by and by, grew into an intimate friendship on both sides which to my great pleasure is still continuing until this day. From him … I have learned to perform not only an adagio [slow movements], which he played in an extremely touching way, but also, insofar as the interpretation of movements and the performance of music in general is concerned, I have learned most from him. He encouraged me to make further attempts in the field of composition. Between 1724 and 1727 Quantz, with the financial support of the Dresden court, was able to complete his education with a Grand Tour, travelling and studying in Italy, France and England. He studied counterpoint with Gasparini in Rome, a skill that he would later put to good use in his Sei Duetti a due flauti traversi (Six duets for two transverse flutes). I began to take instruction from Francesco Gasparini, a 72 year old kind and honest man, who was not only a learned contrapuntist but also an agreeable lucid opera composer of his time. He taught me the principles of counterpoint. Since I already had some knowledge of composition and did not lack in industry, I reached, within the space of six months, the point where my master did not consider it necessary to give me further lessons. … Furthermore, he offered to correct anything that I might compose during my stay in Rome without a fee. A rare example among the Italians! The first church composer in Naples was the Oberkapellmeister and Knight, Alessandro Scarlatti. … I heard Scarlatti play on the clavicembalo, which he knew how to play in a learned way although he did not posses as much finesse as his son [Domenico Scarlatti]. After this he accompanied me in a solo. I had the good fortune to win his favour, in fact so much that he composed a few flute solos for me. He introduced me at various distinguished houses and even wanted to obtain for me a position in the Portuguese service with a substantial salary, but I considered it wise to decline. From August 1726 to March 1727 Quantz visited Paris where he heard many performances. ‘[T]he French style was not unknown to me and I did like their manner of playing very much’, however he did not enjoy the French vocal style. He was also unimpressed by the opera orchestra, but enjoyed the solo performances of many instrumentalists, among them the flautist Michel Blavet, who for a time taught Prince Frederick before he became king of Prussia. However, outside of the orchestra, there was no lack of good instrumentalists. Fortcroix and Roland Marais were good gambists. The first had a great deal of skill, but the latter had more neatness and pleasantness in his playing. Guigon and Battiste were good violinists. The former played in the Italian, the latter in the French style. Blavet, Lucas, the two brothers Braun, Naudot, and several others played the transverse flute. Among them Blavet was the best. His helpfulness and good way of living caused us to become friends, and I must praise him for the many kindnesses which he showed me in various ways. Also, there was no lack of good organists, clavier players, and violoncellists. Now I reflected on all the good and bad music that I had heard on my journey. I found that I had gathered quite a store of ideas, but that it would be necessary to put them in proper order. In every place in which I had stopped I had composed something, imitating the style prevalent there. But, I also thought about the merit which the original has over the imitation. Thus I began to direct my greatest efforts toward the goal of forming a personal style so that possibly I too could become an originator in music. However, it would take thought, experience, and time to achieve this. Thus, whereas formerly a composition might be finished in an hour, I now allowed myself a day’s time, being only too sure that the first ideas might be successful, but that they are, if not always the worst, certainly not always the best. That, in fact, a fine sensitivity and mature judgment are necessary to purify them and bring them into their proper relationship to one another, so that a piece will be popular not only for a short time and fleetingly, but, if possible, always. As well as being a wonderful learning experience, the three-year Grand Tour established Quantz’s reputation outside Germany, paving the way for the future international dissemination of his music and writings. Within a year of returning to Dresden Quantz was promoted to the elite Dresden Court Orchestra (the Hofkapelle), confirming his status as one of the outstanding musicians in Dresden. Up to this time I had been oboist and flautist in the Polish Kapelle … However, during my journey, my place had been given to another, and I was transferred to the Saxon Kapelle. This happened in the month of March in the year 1728 … From this time on I abandoned the oboe completely, because its embouchure is different from the flute, and remained solely with the transverse flute. In May 1728 Quantz accompanied Augustus II (Elector of Saxony and King of Poland) on a state visit to the Prussian court in Berlin. He made a particularly deep impression on Crown Prince Frederick and thereafter returned twice a year to teach him the flute. After I had the honour of allowing myself to be heard several times before Her Majesty, the Queen [of Prussia], I was offered a position by Her Highness for 800 thalers a year. I was ready to accept, but the King [of Poland], my master, would not agree. However, I did receive permission to go to Berlin as often as I was asked for. 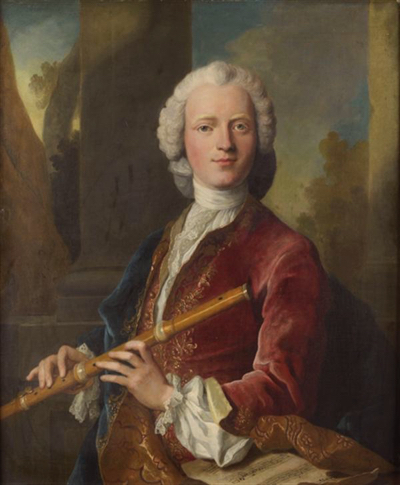 In the same year, 1728, the Crown Prince of Prussia [Frederick II] … decided to study the transverse flute and I had the honour of teaching His Highness. For this reason I had to go to Berlin, Ruppin or Rheinsberg twice every year. 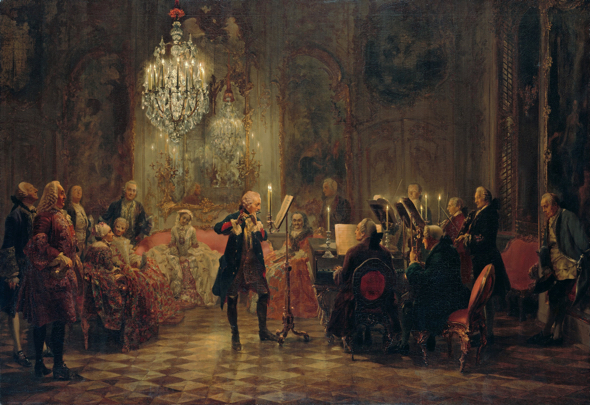 Quantz was actively involved in the musical life of the Dresden court as a performer and composer. He played flute in opera, theatre, chamber and church. 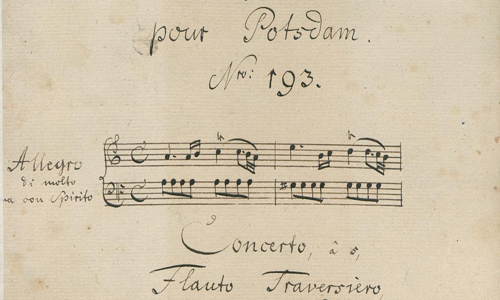 In 1734 he published his Opus 1 consisting of 6 sonatas for flute and continuo. He also composed trio sonatas and flute concertos for use at the court. He married in 1737 and in 1739 started making flutes. Because of the lack of good flutes, I began in the year 1739 to drill and tune some myself, which practice never did me any harm. 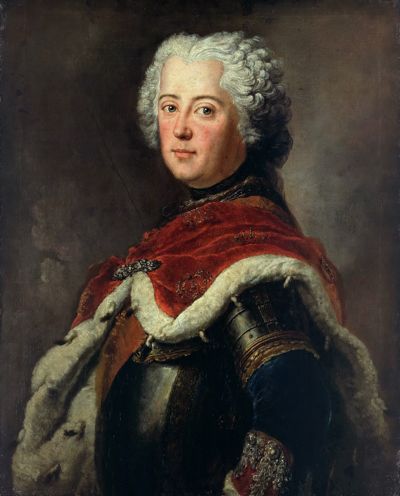 Frederick II became King of Prussia in 1740 and Quantz finally accepted a position at the court in Berlin as royal flute tutor, composer and flute maker. 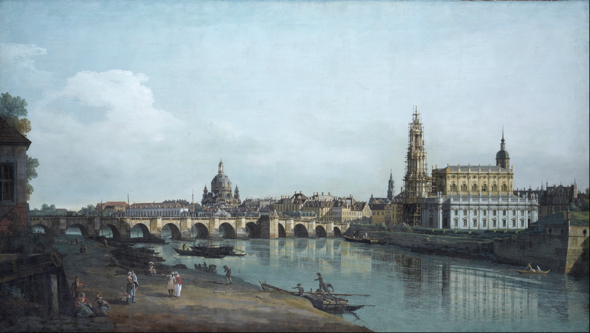 Thus I left Dresden in December 1741, since I began to serve in the Royal Prussian Service at that time. Quantz stayed in service with Frederick for the rest of his life. He worked with the king on flute playing and composition. He supervised the king’s private evening concerts, for which he wrote new works, mainly flute concertos, for the king to play, and he made flutes for the king. Only a few compositions were published during Quantz’s time in Berlin, most notably the Sei duetti, op. 2 (Berlin, 1759). His most significant contribution to music literature is his Versuch einer Anweisung die Flöte traversiere zu spielen (Berlin, 1752), a very influential treatise on the performance and composition of 18th-century music. Quantz composed over 300 flute concertos and around 230 flute sonatas, as well as trio sonatas, duets and solos. As a flute maker, he developed a design (the ‘Quantz’ flute) that enabled him to produce a particularly rich and vocal tone quality that was greatly admired. The sonatas and concertos Quantz composed in Berlin were the personal property of the king, so they were not published and were not circulated widely. When Quantz moved to Berlin, Frederick arranged for all of Quantz’s Dresden compositions (excluding the trio sonatas) to also become his property. Frederick had multiple fair copies made of each work for his various residences: Charlottenbourg, Potsdam, Sanssouçi, le nouveau Palais. Copies of Berlin works were occasionally sent to Dresden. Consequently many manuscript copies of Quantz’s works have survived and scans of some are readily available online from libraries in Berlin and Dresden. This means we can form a good impression of Quantz as a composer. In his Versuch, Quantz devotes a long final chapter — ‘How a Musician and a Musical Composition Are to Be Judged’ — to a discussion of the forms and styles of music in the middle of the 18th century. His discussion is particularly enlightening when looked at in conjunction with his own concertos and sonatas. Quantz developed a distinctly personal style. His music is very expressive. The north Germans called this Empfindsamkeit, a type or style of music that is intimate, sensitive and subjective. His music is also very inventive. It is well-crafted and natural on a very human scale. It is full of engaging and attractive musical ideas, with contrasts of tone, of light and shade. It tells touching stories and you can hear the influence of Italian opera, especially in the slow movements. Within 20 years of Quantz’s death, Christoph Friedrich Nicolai (1733–1811), a writer on music who knew Quantz and edited a multi-volume work on the life of Frederick the Great, was lamenting Quantz’s passing. Style in music, and the style of performance related to it, is like a beautiful flower that delights intimately, but soon withers, rarely blooms again, and even more rarely bears fruit. Hitherto musical style has changed every twenty years or even more rapidly. So it was formerly … and so it will continue. The low tuning of Quantz is no longer used; departed with it are Quantz’s flutes, Quantz’s concertos, and the true art of playing them, without which they suffer indescribably. Now there are perhaps no more than three people in Berlin who still know the way to play them. The English translation of Quantz’s autobiography is published in P. Nettl: Forgotten Musicians (New York, 1951).